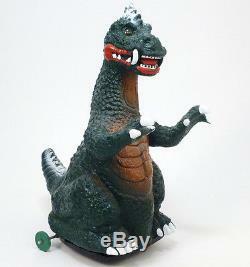 This listing is for a MONSTER ARON battery operated robot made by Yonesawa, Japan, in the 1960s. Measures approximately 12 tall and made of hard vinyl with a tin base and motor. Features bump-n-go action with lighted eyes and "roaring" sound. Excellent condition overall and works great. For more collectible character toys. 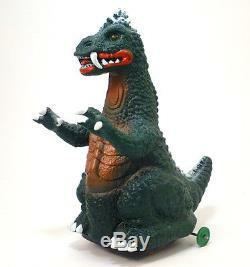 The item "1960s MONSTER ARON Battery Operated Godzilla Toy YONEZAWA Japan RARE" is in sale since Wednesday, March 16, 2016. This item is in the category "Toys & Hobbies\Electronic, Battery & Wind-Up\Battery Operated\Pre-1970". The seller is "vintagetoy" and is located in Upstate, New York. This item can be shipped to United States.